Giga events: for when a Mega just isn’t big enough! An event must have 5,000+ attendees to be considered Giga. That’s a lot of geocachers in one place. 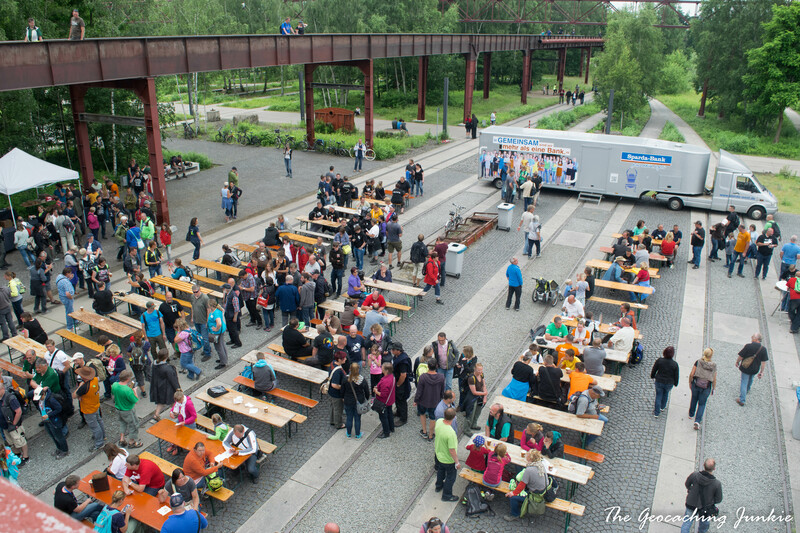 I wanted to experience one of these mass gatherings for myself and Project Glück Auf (GC55555) in Essen, Germany looked very interesting – an event located at the formerly biggest coal mine in Europe. I didn’t need much more convincing and booked flights for The_Mother and I to Düsseldorf for a fleeting visit. 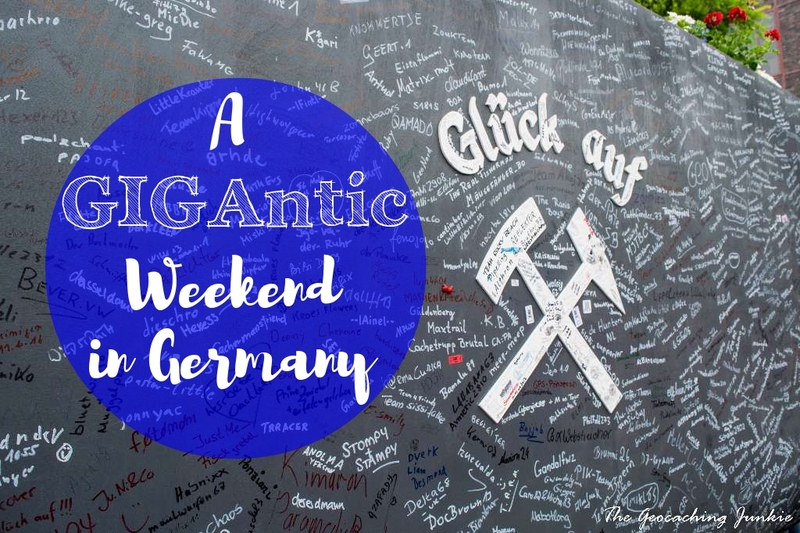 In the end, six of us hopped over to Germany for the Giga event, as we were joined by Fjon, the swerve, cep99 and THE_Chris. THE_Chris, cep99 and the swerve were sensible and travelled over the day before the big event; the other half of the posse got the stupid o’clock flight over on the morning of the Giga. The fun-filled day started when the alarm went off at 3:50am. A quick 1 hour 40 minute hop over to Düsseldorf and then a relatively short train ride had us arriving in Essen. 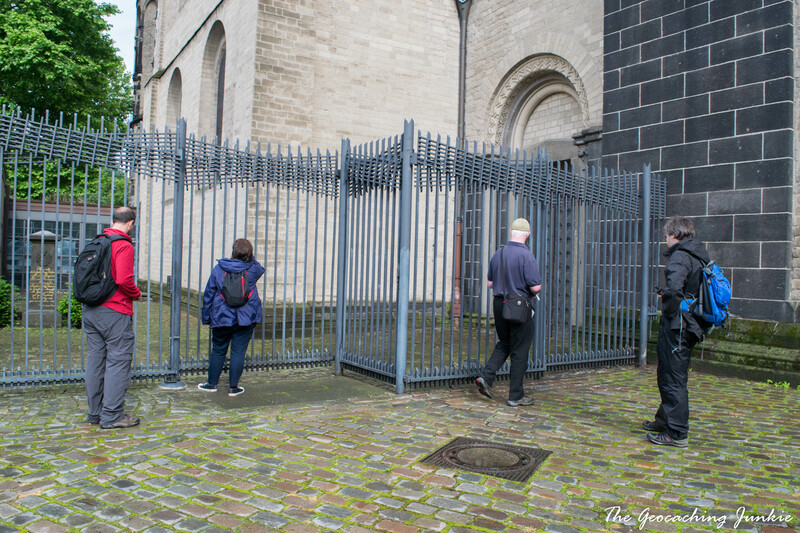 Once our bags were dropped off at the hotel, we squeezed on a tram headed for Zollverein. When I say ‘squeezed’, I mean we were very lucky to even get on – others who tried to at subsequent tram stops simply couldn’t fit. 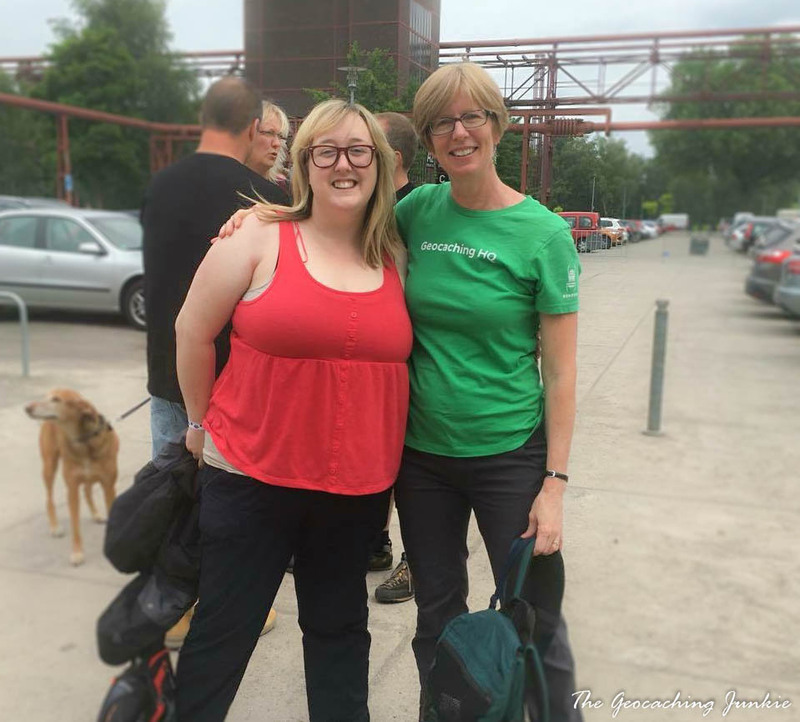 That’s what happens when so many geocachers congregate in one city. I’m sure the locals were very pleased. As we headed towards the first queue of the day (registration), the imposing Shaft 12 loomed over us in all its Bauhaus glory. 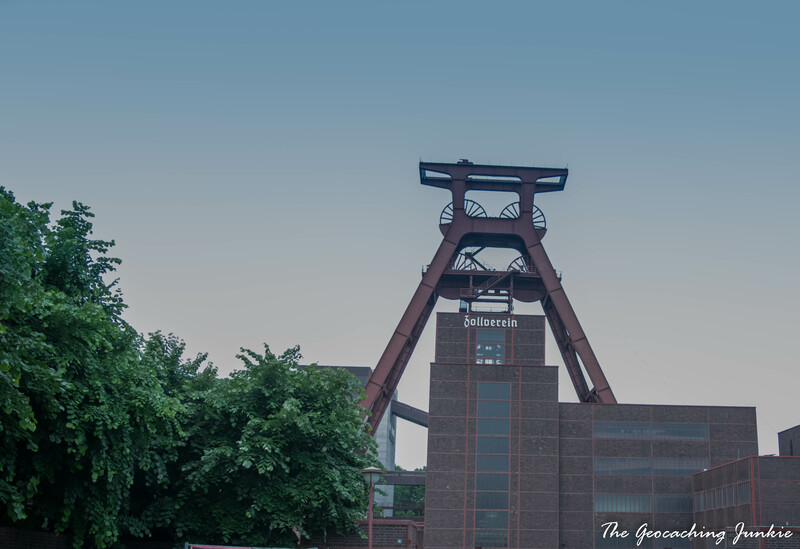 Built in 1932, the structure has become synonymous with the Ruhr region and has earned the site a reputation as ‘the most beautiful coal mine in the world.’ If you’re going to visit a coal mine, I guess it makes sense to visit the most beautiful one. After registration, which ran as smoothly and efficiently as you’d expect at a German event, we met up with the rest of the gang and decided to spend ten minutes in the hall of geocaching wares. This was not a relaxing activity. There were simply too many people to properly look at anything. We were queuing up just to peruse what was on sale. Luckily, I had pre-ordered my Giga coin and picked that up at registration. I also managed to somehow purchase some wooden trackable items. I spent way too long coveting the largest Signal plush toy I had ever seen. “It would be mad to buy it”, I thought, but it was so very tempting. I kept seeing them everywhere though, these giant Signals: some naked as the day they were sewn together, others dressed in full dirndl outfits. As most of us made our way to the escalators at the visitors centre to work on a lab cache, The_Mother headed back and purchased adopted a Signal. We have decided on joint custody, and he will be accompanying me to events in future! There was so much to do and the queue for the logbook was so long that I volunteered to stand in it while the others sussed out what else was going on. Listening to discussions taking place around me, I discovered I was not in the queue for the event logbook, but rather for a cache. Well, I was nearly at the top at this stage so decided to stay put. You know you’re at a Giga event when… you accidentally join the queue for a logbook without realising it! 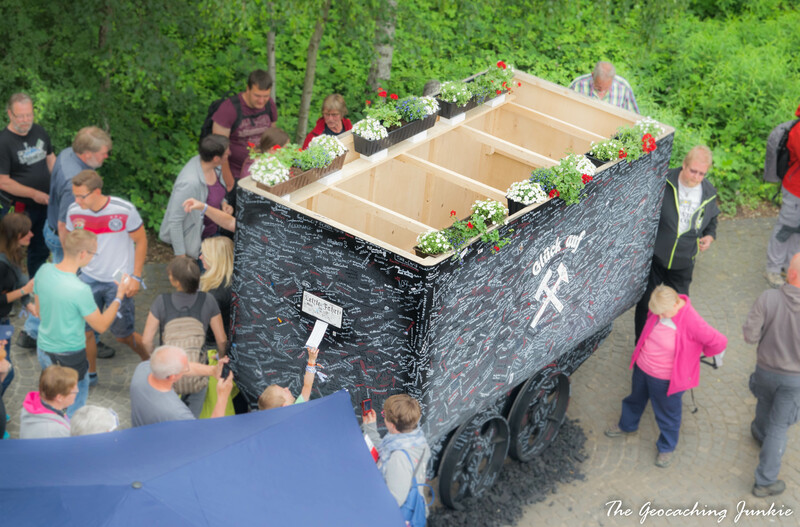 The actual event logbook was a makeshift coalmine cart – very cool! On Giga day, red and white markers were provided to sign it. The trackable ‘table’ had an eclectic array of items, including a bin, an old rotary phone and a large piece of driftwood. There were lots of codes to discover, though, as with everything on the day, you had to wait your turn to get close to the table! There were also lots of trackable people walking by. This must be one of the weirdest things about Mega and Giga events – taking pictures of people’s backs/sleeves/backpacks without even talking to them. Weirder still was when I was later accosted in Essen city centre by someone trying to find a trackable number on Signal. 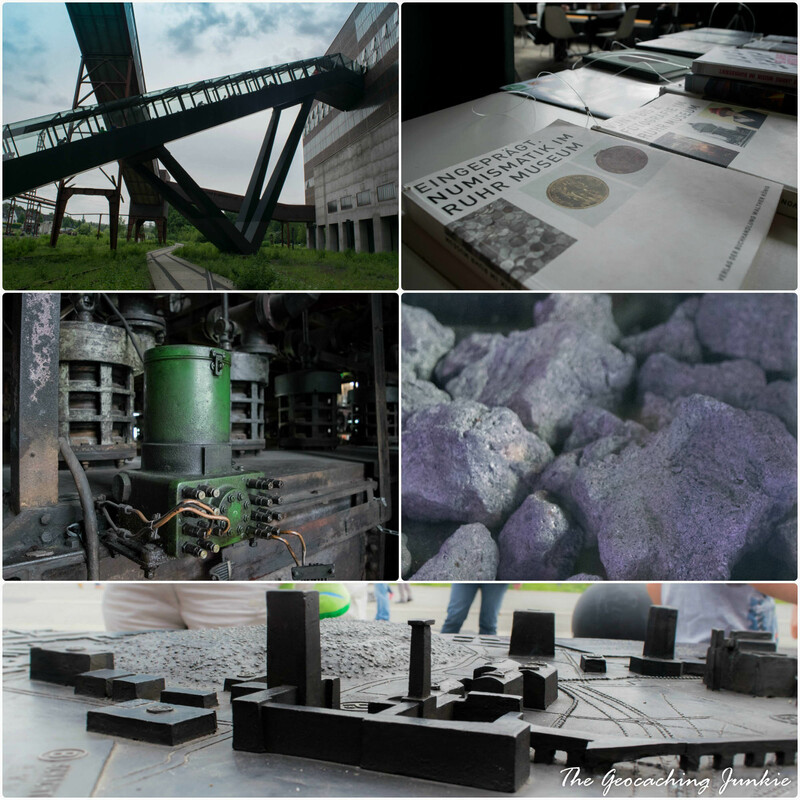 We spent quite a while wandering around Zeche Zollverein completing the wherigo cartridge, The Simpsons (GC2WG83). It was a clever little cartridge, but the back and forth to various locations was taking its toll on us in the heat, and afterwards, we had a well-deserved and needed beer, snack and sit-down. 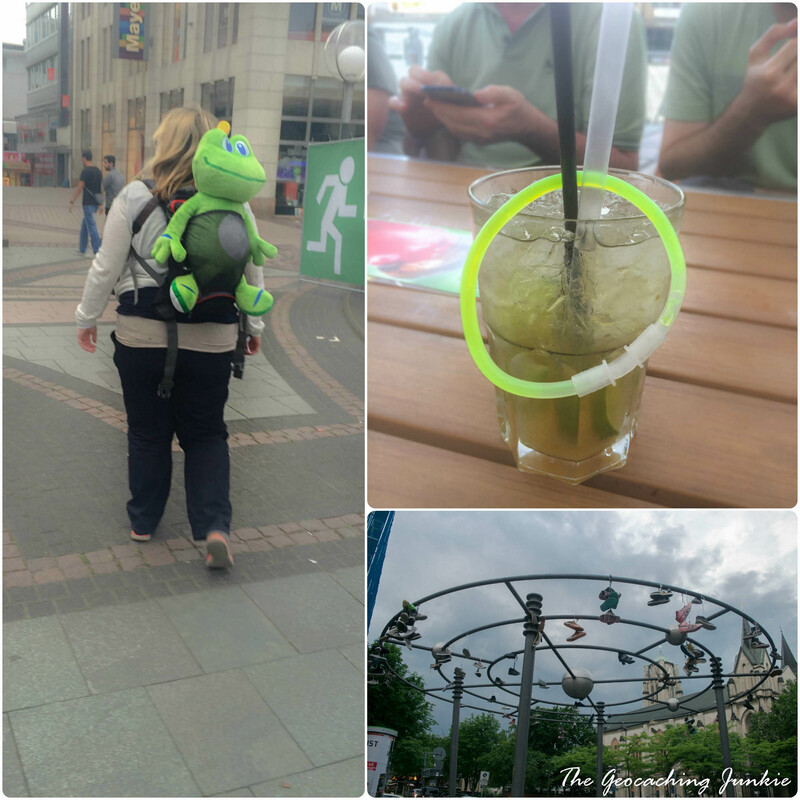 What was left of the day was spent in Essen city centre, turning green boxes in to smilies on the map, with Signal the Frog strapped to my backpack for much of it. Inevitably, we met cachers at most GZs, though there weren’t queues like there were at the caches around the Giga location. The evening was ended with a round of Schnitzel for all, as well as beer and cocktails. 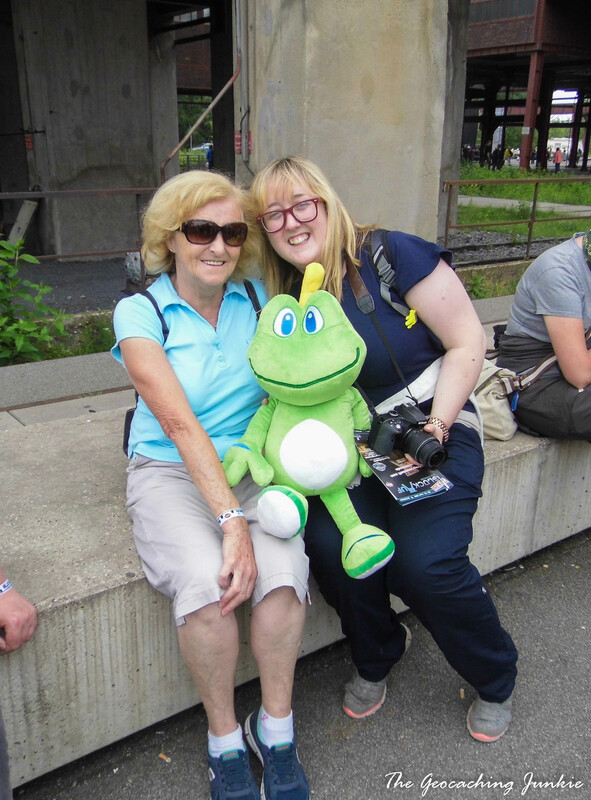 On Sunday morning, we attended the farewell event Glück Auf 2016 – Schicht im Schacht – Goodbye (GC55556). 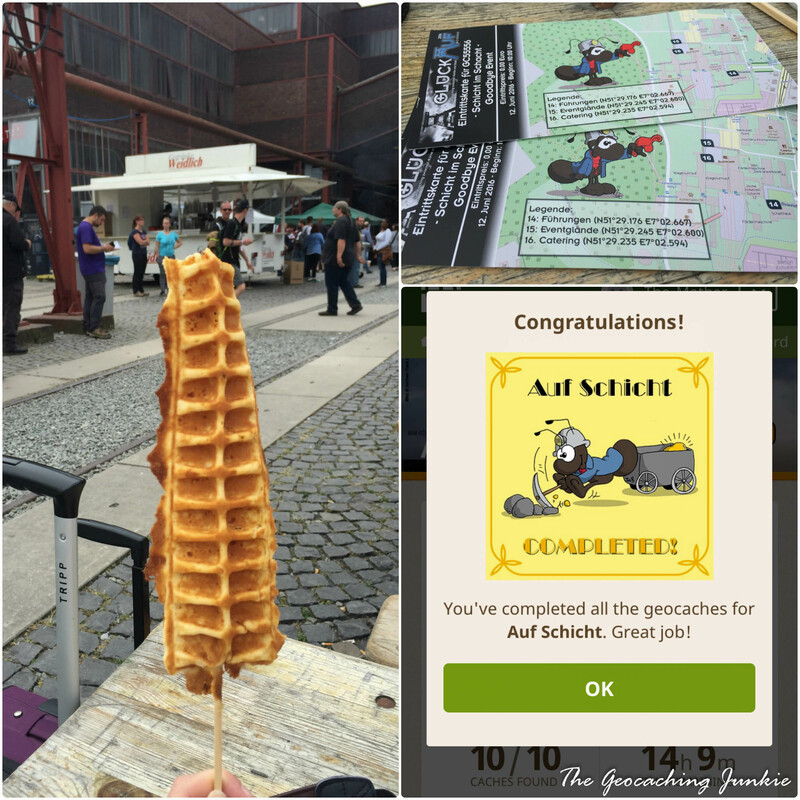 Nothing special, just a waffle-on-a-stick breakfast with over 2,000 of my friends – just a typical lazy Sunday. The ‘logbook’ for this event was the attendee ticket. You signed your name on it, then ‘punched in’ your attendance, before dropping it in the letterbox in the mine cart from the day before. Very fitting for the event name: Schicht im Schacht. Schicht is a (work) shift and Schacht is a shaft (like a mine shaft), but the phrase is actually an idiom meaning ‘that’s it’ or ‘let’s call it a day’. It worked on so many levels! After breakfast, we completed the labcaches, which were a series of QR codes that revealed a code. It was great to nab 20 labs over two days. For those that attended the welcome event on Friday, there was a chance to find 30! Before we left the Goodbye event, I had a chance to chat with Frau Potter, one of two lackeys from HQ that attended the Giga. Over breakfast, the gang hatched a plan to go for three webcam caches: GCPA17 in Duisburg, GCE3F3 in Düsseldorf and GCKZK7 in Neuss. Given that all of us had found very few webcam caches ever, three in a day seemed like a pretty good use of our time! We picked a great day to visit Duisburg: apart from a few heavy downpours, we enjoyed the regatta taking place on the River Rhine. There was lots of hubbub, but it didn’t deter us from finding a few nice caches while we wandered around. 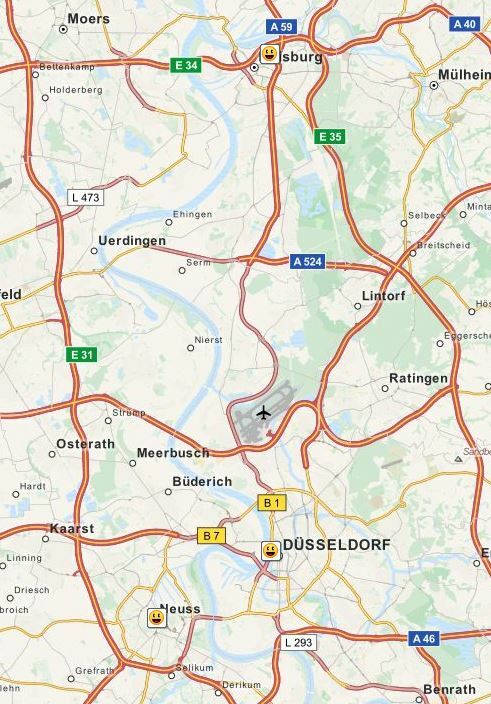 Next up was a brief stop in Düsseldorf to nab the webcam cache there. 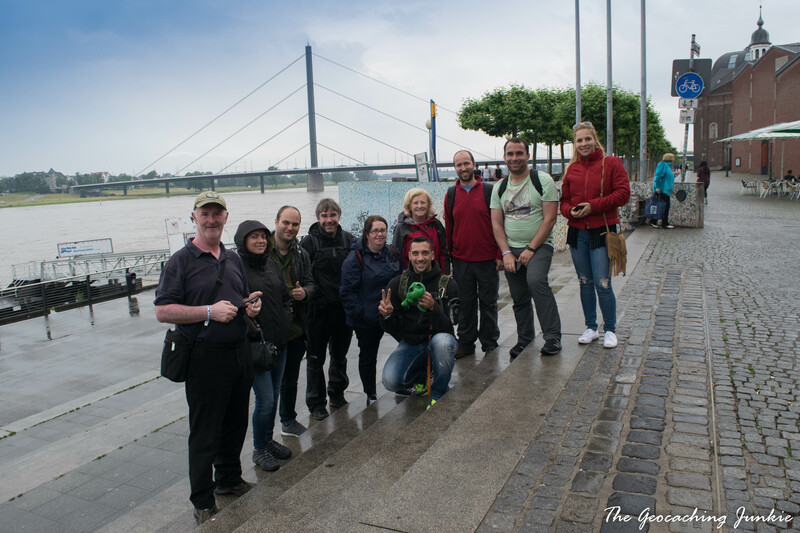 While looking for the right place to stand to get in the shot, we bumped in to a group of Portugeuse cachers with the same idea, so there were quite a few of us in that webcam photo! Our last stop before heading to the airport was Neuss. For the webcam cache there, we had to stand in front of the camera holding signs with our caching names on. Well, we hadn’t pre-planned at home so we didn’t have any elaborate signs. Instead, cep99 and I got to work on the bus creating makeshift signs on the back of hotel confirmation emails and flight details! We almost had our only DNF of the day in Neuss at Was machen denn die Namen hier? (GC4P334), even though it wasn’t meant to be a particularly tricky hide and we’d found trickier caches with ease earlier in the day. After a good 20 minute search or more, cep99 came up with the goods! It was nice to end the day with zero DNFs! Finally, it was time for The_Mother, Fjon and I to head to the airport while the others stayed another night. It was a great, albeit quick, weekend! Although there were so many more people, it didn’t feel hugely different to a Mega event. Maybe a bit more queueing but I had somewhat prepared myself for that, knowing that there would be such big numbers in attendance. The event location was really nice, and added so much to our overall experience. The best part, of course, was getting to spend a purely caching weekend with friends! Many thanks to the organisers, who did such great work bringing everything together on the weekend. 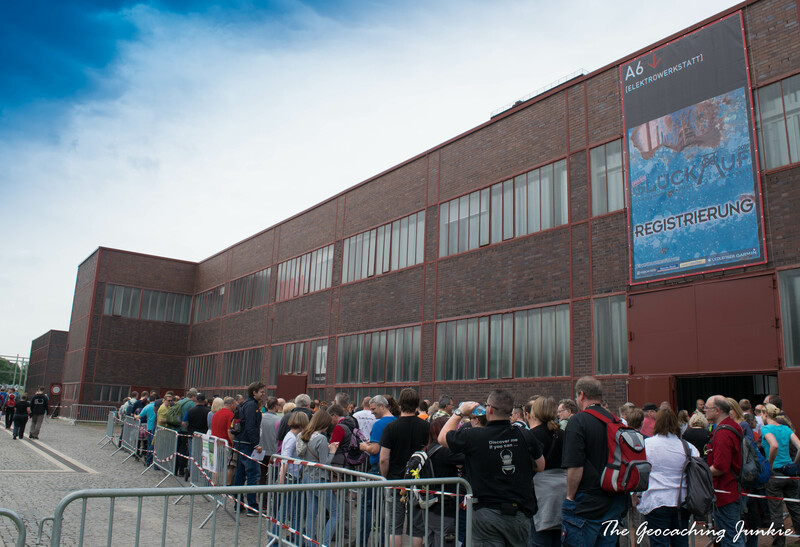 Have you been to a Mega or a Giga event yet? Did you like it? Let me know in the comments. I’ve been to three Block Parties (2013, 2014, & 2015), 3 Going APE Mega Events (2013, 2014 & 2015), and the 3IEE (3rd International EarthCache Mega Event). This year I’ll be going to Going APE 2016, but have no other Mega events on my immediate horizon. I wanted to go to Geowoodstock 14’er and Sails, Rails and Tails 2016 (WestCan6) in a mega 2-week road trip, but there’s no way I can get that kind of time away from work and the family. The only other Mega within driving distance of me is this coming weekend, the Tri-Cities 2016 Geocoin Challenge. Unfortunately, it’s the same weekend as our year-end scout camp, so I can’t go. 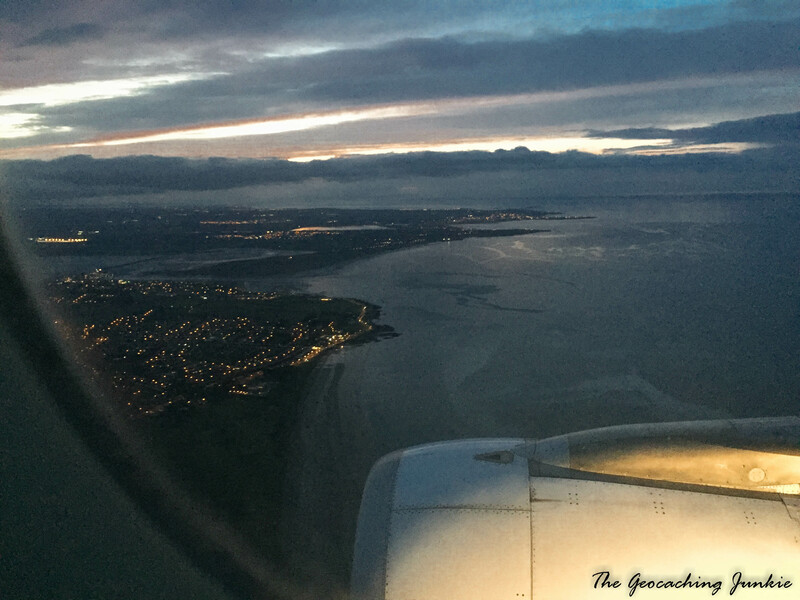 Last year I went to my first mega which was pirate mania and loved it but I was a bit jealous of all the people going on to the uk mega so this year I made a plan to go onto the mega from pirate mania. Then geolympics was announced so thought oh go on then 3 Megas in 8 days why not. But before that I also attended my first ever giga. Which was Gluck! And it was amazing. I was one of those people in the queue for the shops an hour before they opened so that I could get my hands on the kingz coins before they sold out. Got a bit dicey in there as well where I was knocked out of line and nearly pushed over. I’m not entirely sure that Germans actually queue. Anyway o got my coins :-). Now that I’ve seen your pic of signal in his backpack I remember you! I saw you at the breakfast event lol. I’m going to all three Megas in the uk too 🙂 wouldn’t have been me at the goodbye event – I had him tucked in my case at that stage! Loads of people had signals attached to their backs though. I saw one lady with a signal in a baby carrier on her front!!! Thanks for this, another really well written account and fabulous memories. So gutted I didn’t see you guys, let’s sort it out in the summer eh? Definitely! Are you camping in Wales? I’ll be at all three Megas so hope we can meet at some stage! I’m one of that portuguese cachers on that webcam photo in Dusseldorf! What a coincidence! Hope everithing is ok with you!